When the re-imagined version of Battlestar Galactica went off the air in 2009, many fans clamored for the opportunity to re-visit the universe via whatever means possible. The big wigs at the SyFy Channel, the original producers of the revived series through Universal Television, answered the demand with the spin-off series Caprica, a show set on the famous capital of the Colonies nearly 60 years before the events of BSG. While the public hoped for something more in the line with the “mankind’s fight for survival against an unrelenting foe” vibe found in the first series, “Caprica” was toted as “television’s first science fiction family saga” with the plight of two very different families (the Greystones and the Adamas) brought together through tragic circumstances. While show creator Ronald D. Moore wanted to create a “sci-fi version of ‘Dallas’,” his effort viewed more like a poorly executed, gag-inducing melodrama than the epic space opera that was its predecessor. After only airing nine episodes of a split season, “Caprica” was cancelled due to poor ratings. 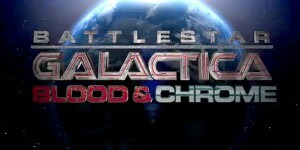 So when news hit the web of the possible production of a prequel series called “Blood and Chrome” featuring a young William Adama — the tough as nails Commander turned Admiral of the Galactica played by the legendary Edward James Olmos — and his rise through the Colonial Fleet, many devotees to the franchise (including myself) were very excited. Imagine going back to the First Cylon War, seeing Adama grow from green Viper pilot to the grizzled veteran that would eventually save the remnants of mankind. It only adds to the enjoyment of watching the re-imagined series possibly knowing what’s on Adama’s mind when certain situations arise in BSG due to his previous encounters with the enemy. It’s a level of narrative depth normally unobtainable in modern television. Fast forward to this fall, when the pilot was split into 10 smaller episodes for distribution on the web via Machinima Prime. Today marked the release of the web finale of “Blood and Chrome” and fans of BSG would do themselves a disservice by ignoring this amazing drama even if it was short-changed in the grand scheme of things. Here’s a playlist of all the episodes in one easy to view YouTube window. Enjoy.